"Bill was killed when the second building came down, and he was crushed under all the debris. I don't know if he jumped back under the underpass, or whether the direct debris killed him. We know in his last picture he was working to the very end, and that's telling of the commitment he had to his work." Cip East. Bill was one of 51 journalists killed in 2001 whose names were added to the Journalists Memorial. The memorial underwent its annual rededication with the new names May 3. Wendy Doremus, Bill's wife of 21 years, spoke during the ceremony, a number of family members attended. The memorial now includes more than 1,400 names. 2001 was the worst year since 1995 for journalist fatalities -- mainly due to assassinations and murders. It was two weeks after two jetliners had plowed into the towers of the World Trade Center. 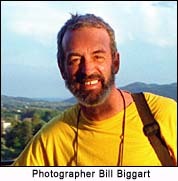 His good friend, photojournalist Bill Biggart's body had been recovered from the rubble. His personal effects, including his cameras had been released by authorities to his widow, Wendy. Biggart. a photographer, who had worked for an alternative New York picture agency, had been carrying three cameras with him, when he left his home in Manhattan that sparkling Tuesday morning, and started walking south towards the plumes of smoke. There were two Canon EOS1s film cameras. He was also carrying his Canon D30 digital camera. For Biggart, mastering the new techniques of digital photography had been a break-through. When Chip East was handed the bag containing Biggart's gear by his widow, Wendy, he was convinced that no pictures had survived. The avalanche of falling debris had blown off the backs of the two film cameras. There were several rolls of film in Biggart's bag; however, the lids of the film canisters had been peeled back, allowing light to fall into the cassettes. Finally, East turned his attention to the digital camera. It was covered by ash. The lens had been sheared off at the flange. But when he opened the chamber that held the compact flash card, it was pristine. "As you scroll through 150 pictures or so, you are not only just looking at a guy on the street making deliberate pictures, but they are framed a certain way, tells us something about the photographer as well. In this first frame we see trees, and the buildings in Manhattan framing the burning World Trade Center. I think a lot of people would have photographed that tight, and looked at just the main story. But to see it framed by a part of New York as he was walking through Greenwitch Village is somewhat symbolic of Bill Biggart and how he made pictures. Also, the fact that he was from New York, and with trees in the pictures, I don't know, maybe it is inferring too much, but it means a lot to see foliage, and to see one of his other passions (trees) in the first pictures. "As I looked at them for the first time, it wasn't just the pictures, but I was looking around and listening to those of us who were at Bill’s studio. Hearing Bill's wife, Wendy, saying things like, ‘Oh Damn, Bill, why are you so close;?’ really meant something too. Here we were two weeks after he was killed, and she was still talking to him, through his pictures. "As you get there, the unique angle of looking straight up at the buildings, you never saw that from anybody else. As you go through the timestamps, the cloud of dust comes towards you. You just see this massive cloud framed with fire trucks and police cars, and firemen and policemen. "So we are looking at the cloud coming towards Bill and the 30 seconds worth of pictures that Newsweek did from 9:59:10 to 10:00:08, which is basically when the first cloud covered him. In the pictures, he frames up when the cloud is right on him, and you still have the North tower, framed right in there. "He is going closer and closer, as you go through, you see peoples reaction, and you see how people are handling all this... every one of Bill's pictures are about people and how they are reacting to this story. We need to remind ourselves this story isn't about buildings, but about how people are effected by the loss of these structures. "So we track through to the end, and we see the second to the last frame. He is moving forward, he is walking down West street, and he is moving towards the pedestrian overpass connecting the World Trade Center and the World Financial Center. Bill is getting closer and closer, and you see more firemen and fire trucks and the second to the last frame you see policemen, and fire trucks under the overpass. "And then you see the last frame that nobody else will ever have. You see the honeycomb pieces of the first building... and we see half of the hotel that was destroyed as well. After the second building fell, the hotel, the Marriott I think, was gone. You see it cut in half from what fell from the first building and it is time stamped 10:28 and 24 seconds. Basically that time stamp is the end, because at 10:30 is when the second building came down.